After Portland slacker John Callahan (Joaquin Phoenix) nearly loses his life in a car accident, the last thing he intends to do is give up drinking. But when he reluctantly enters treatment – with encouragement from his girlfriend (Rooney Mara) and a charismatic sponsor (Jonah Hill) – Callahan discovers a gift for drawing edgy, irreverent newspaper cartoons that develop a national following and grant him a new lease on life. Click Here & Never Miss A Review! A superb performance is the very least we have come to expect from supremely talented actor, Joaquin Phoenix. We have already been treated to at least one such performance (I’m thinking more hitman than Jesus) this year. So, you’ll experience no real surprise when I report that his portrayal of John Callahan in Don’t Worry, He Won’t Get Far On Foot is pretty darn astonishing. After watching Gus Van Sant’s film (based on the cartoonist’s autobiography) I looked at some video footage of Callahan himself. Phoenix portrays him to perfection - from his mannerisms to his (softly spoken) voice. It feels slightly odd, therefore, that Gus Van Sant chooses to play his film so safe. John Callahan was a unique and complex character - someone who challenged political correctness to the very end of his life. He surely deserved a far more edgy biopic than this. However, this is not to suggest that I didn’t enjoy Don’t Worry. It is an entertaining and endearing, upsetting and moving examination of addiction, recovery and redemption. While the film felt muted at times, I was certainly never bored - how I could be whilst watching Joaquin Phoenix? Phoenix is ably supported by an impressive cast (including Beth Ditto as Reba and Kim Gordon as Corky). Jack Black gets to be very (drunken) Jack Black before revealing something far more sensitive and poignant. Rooney Mara, while not given much to do, is always a welcome screen presence. However, it is Jonah Hill’s portrayal of Callahan’s Alcoholics Anonymous mentor, Donny, that really startles. Barely recognisable, he gives a wonderful, restrained performance - one that emphasises the power of therapy and also acknowledges the futility of motivational books and phrases in the face of real human adversity. Don’t Worry is an engaging and enjoyable exploration of a troubled and, ultimately, inspirational life. It reminds us as much of the dangers of addiction as of the hazard of political correctness and emphasises the power of laughter over pain. 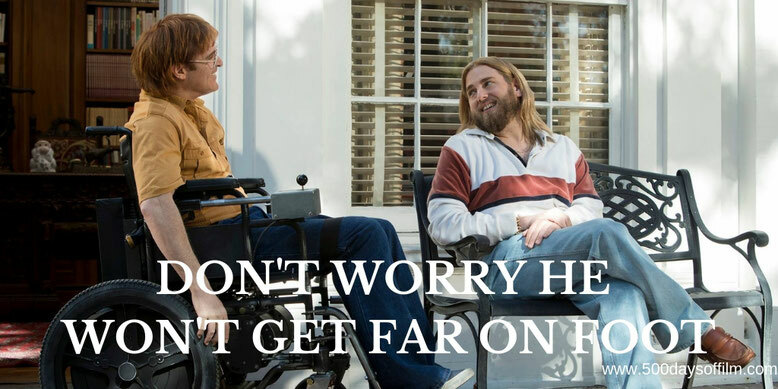 Have you seen Don’t Worry He Won’t Get Far On Foot? If you have, what did you think of this movie? Let me know in the comments section below or via Twitter. You can find me @500DaysOfFilm.